Winter days mean afternoons in the warm with a good movie, and one of my favourites is 'The Big Country'. Now we all know that Gregory Peck is the star (and what a fine job he does). He plays James McKay, an ex-naval captain who travels to the West to marry his fiancé who lives on the Terrill ranch. Men are tough there and there is some initial doubt as to whether McKay is tough enough. As the film progresses, we learn that he is; he just does things his own way. Even the famous fight scene with Steve Leech (Charlton Heston) takes place in private and ends with the classic line: ‘What did we prove?’ He also shows his mettle by (again secretly) riding ‘Old Thunder’ the ‘unbreakable’ horse. The scene stealer is Burl Ives. His entrance at the engagement party is movie genius. As patriarch Rufus Hannassey, he leads the family which is in contention with the Terrill’s for grazing rights in ‘The Big Muddy’. But my meal is for his son, Buck. Poor Buck; he is forced to be tough but cannot, as hard as he tries, win his father’s respect. He loves ‘Julie the Schoolie’ (Jean Simmons) and at one point, in a vain attempt to woo her, he invites himself into her house and eats her stew. 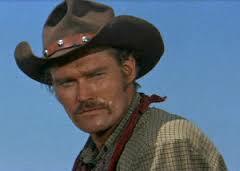 Buck Hannassey is played by Chuck Connors. His performance is right up there with the others although his name is less well-known today. In his time, though, he was a successful baseball and basketball player and had a long-running stint on American series, ‘The Rifleman’. In 'The Big Country', Buck Hannassey is a mixed-up man. He craves acceptance from his father and many of his mistakes are made attempting to win the slightest of praise. At the end he is rejected by the man he so wants to please and by the woman he (probably genuinely) loves but whom he has abducted in another desperate scheme. 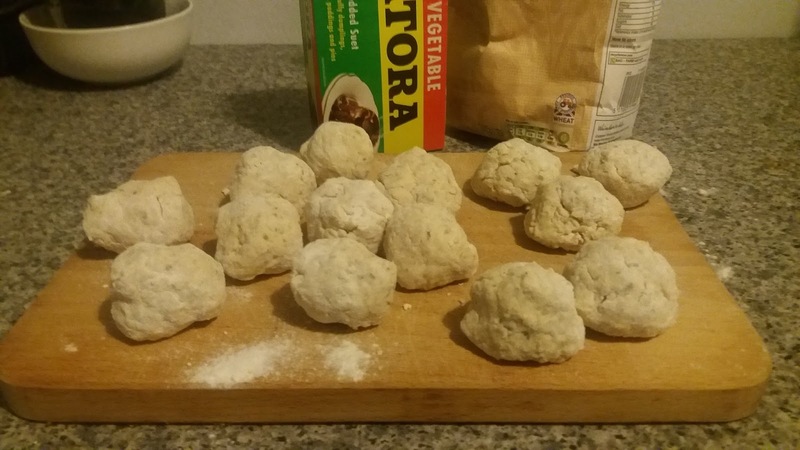 So, I think he might like this lovely stew with dumplings. It could warm his heart and show him that he doesn’t need to try so hard. This one is made with vegetarian sausages but you probably wouldn’t even notice. The chilli adds a little kick which a hard-living man would enjoy. Oh, and by the way, the Big Country has them best theme of any film ever. We could play it while we eat. Chop each sausage into four. Heat the oil in a large pan and fry the sausage until brown. Remove and set aside. Fry the onion and pepper for a few minutes until almost soft. Then add the garlic and continue to cook until all just brown. Put the sausages back in the pan. Add the beans to the pan with the tomatoes and tomato puree. Sprinkle in the mixed herbs, bay leaves and sugar and stir well. This dish is even better if prepared in advance and re-heated when needed. 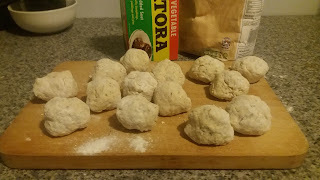 It is even better again if you add these dumplings. You can cook them separately and stir them in. Add enough of the water to bring them together in a soft dough. Add to hot stock so that they float on the surface. 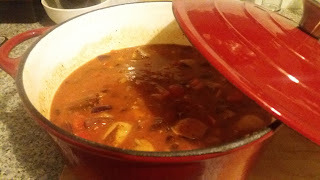 Cook for about 20 minutes (add to stew about 20 mins before serving).